... it's not for everyone. a brain fills too quick. I cannot lose this constantly collapsing box. Recently my wife and I had the opportunity to view “Won’t You Be My Neighbor?“, the new documentary on the life of Mr. Rogers at the Tull Family Theater. This is one of those few and rare documentaries that has the capability to alter how you live out the rest of your life … not because of the film maker, script writer, or directory – but simply because of how the man the documentary is about lived his life. To set one thing straight up front … the rumor that Mr. Rogers created all of the Millennials in the world because of the “You Are Special” mantra, you need to watch the film or watch the last college commencement he gave … that’s not what “You Are Special” was even remotely about. To those who hold on hard-core to what society tells them is right, or fears becoming friends with someone who might be slightly off-kilter from their beliefs, or fears talking with someone who is not 100% perfect – skip this film, because you will change and have these things happen to you after watching it. 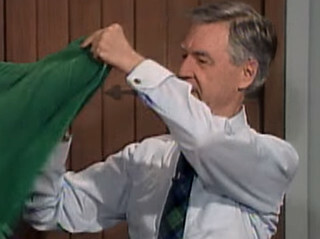 Mr. Rogers was a Christian …. an ordained minister. He was probably one of the very few people who acted as a Christian should act: show God’s love, grace, and understanding. He didn’t have to tell anyone that’s what he was doing – ever. They just knew. The children just knew. That’s how you knew he was real. He was the kid that was made fun of when he was little. He was the kid that was sick much of the time when he was little. He became the man who raised all of us and showed use that being a man wasn’t a stereotype. He promoted equality better than anyone else (without pushing other’s rights aside to do so) … and stood for nothing less. He taught us how to have self-worth without destructive pride intervening. He promoted humanity without eliminating “human”. By example, he showed that hate was not an option. We are all the same -“human”. That’s simply what he was teaching us. Kudos to Mr Rogers …..
trying to escape the urban skew. a central heartbeat of all. it let it slip causing a great fall. leaving family behind with other roots. that bridge – the longest mile filled with asphalt black. decisions to be avoided at best. i see the path abruptly end. It’s Memorial Day in the United States. Even if you are not from our country, please remember someone today that gave their life so you could have a chance at yours. Power … it’s an amazing and amazingly useful thing. From a simple think like electricity that give us the easy life – heating our homes, cooking, keeping food fresh … it’s wonderful. I think if people went back to the old days where you had to go to market daily or, well, kill a chicken here and there on your farm for food, etc people would very much appreciate how much less than simply power is – when applied in its correct context. Then there is the other “power” – political and otherwise. Many times it’s a power that starts out for good – freeing people and otherwise, many times from tyranny. So, why many times does that good power “go south”, get rusted, and eventually possibly become what it was initially fighting to correct? Power is useful when used with good guidance. When that guidance is ignored or no longer sought out, it becomes like an older part of a power grid – the rust takes over and no longer efficiently transfers electricity across that part of the grid (holding back services from those that need it). Lot’s of time checks and balances are in place, the rusting is noticed, and replaced with new sections – and the power flows again to those that need it. The other reason … we just don’t to even start discussing a subject like this because people are “tired of dealing with it”. Well, sometimes you have to deal with things … in a positive manner. Sometimes those dealings take time. Sometime with baby-steps so small that you may never see the end result in your life time. So, next time you want to vent on Facebook on another popular social media venue – maybe take a day to cool down and email or write to someone that can get that rust that is impeding whatever power problem you have removed or remidiated. It may not happen that day … but maybe your children will have a much brighter future because you took a few minutes to put somthing in motion. Save the world — talk to someone, write a letter, care. Baby-steps are still steps. in the morning a little bit glossy. it ain’t gonna help you light a candle wick. nothing giving that super tight grip. well … it’s usually green. We decided to compliment your “case of the Mondays” with our “case of bad poetry” ….. enjoy. You gotta admin – the pic is cool, though. not able to turn back stay. clearing stress cleaning life emptying mess. $1, $5, anything helps buy us time to write. All works copyright 2000 - 2018 Lawrence A Capozzolo unless otherwise stated. Offenders will be forced to wash my car and clean up after my dogs. All copyrights/trademarks/logos for other companies are theirs, we don't own them and remove them immediately upon their request to do so.